-Both pics contains almost the same number of equipment. But on the left pic is where you can see my TV bowing down right in front of my bed. That white rope hanging almost right in front of my TV is my exhaust fan's switch. 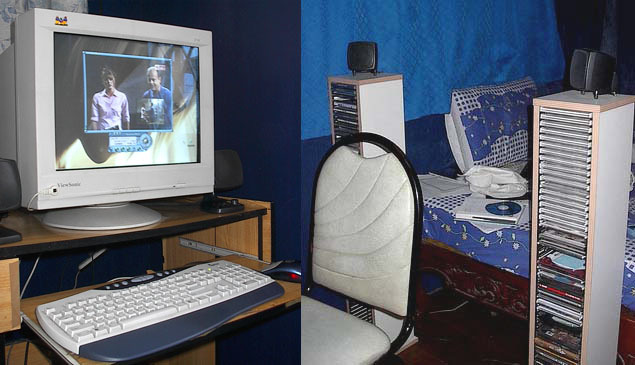 -The right side of the pic is where u can see my entire PC setup. (From left-to-right, top-to-bottom) My subwoofer, UPS, CPU with my Videocam (acting now as my webcam) on top of it, cassette tape rack (with my gamepad on top), my stereo headphone and headphone with mic (can be barely seen 'coz its behind my speakers), my landline phone (cable converter underneath it), my capture card remote controller, my front left/right speakers in between my monitor, my keyb/mouse, photo printer, VHS player, and my left/right rear speakers on top of my CD-tower. -The heatsink with blue fan is my processor's cooling solution. -That black exhaust fan on the left side is one of three (yeah I really want to keep heat away from my system hehe!) extra cooling fans that I added for my setup. -The purple PCB card is my videocard followed by my internal modem and black colored PCB soundcard. -And the last add-on card is my Capture/TV card. -Those 2 bracket underneath are for my on-board sound output slots, USB 1.1 slots with Diagnostic LED, and USB 2 slots. -Top-right now ... we have there my CD-writer and CD-ROM drive. -Followed next by my floppy drive and my hard drive. A closer look at my PC monitor (with its remote control receiver on the lower left part), speakers, and CD-tower etc. I just noticed that lots of my discs are still missing, my friends borrowed 'em half a year ago and haven't returned 'em up to now! wahehe!